Tom Bihn Introduces The Zephyr Laptop Briefcase | OhGizmo! By Andrew Liszewski on 06/14/07 • Leave a comment! The Tom Bihh Zephyr is basically the little brother to the Empire Builder briefcase I reviewed almost a year ago. (Where does the time go?) Just think of the Zephyr as the mid-sized version designed for people looking for something more compact but with similar functionality. The main compartment opens extra wide thanks to a unique ‘bellows’ system and includes plastic dividers for organizing files and other documents inside the bag. 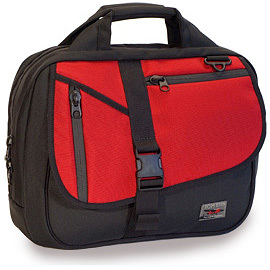 It can also be used to carry a laptop when combined with one of the Tom Bihn Brain Cell padded cases. But there’s nothing stopping you from sticking an unprotected laptop in there either. A large front flap with three outside pockets is used to hide a larger zippered pocket underneath as well as a pouch featuring 3D pockets for PDAs, cellphones and anything needing a bit more protection. My favorite feature is the ‘roll-aboard’ slot on the back of the bag allowing it to be stacked on top of a suitcase and secured to the extending handle making for one less thing to carry when traveling. The Zephyr is currently available on the Tom Bihn website in a variety of color combinations for $140.